In the late middle ages, England produced several important Christian mystics, including Richard Rolle and Julian of Norwich. They were visionaries and authors for the broader tendencies of late medieval Christianity toward personal, direct and intense religious experience. 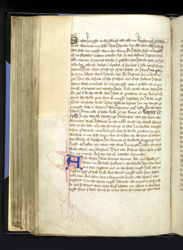 An assemblage of some of the theological writings of Rolle and Julian, this manuscript presents the writings in English, some of them being translations--especially those Rolle--from Latin. It probably would have been studied as part of the spiritual practice of a monk or nun, or possibly an anchorite (a hermit). Julian of Norwich, who probably was a Benedictine nun and lived as a recluse in the anchorage at St Julian in Norwich (belonged to Carrow Priory), wrote an account in 1413 of her mystical visions and spiritual experiences in a book which survives in more than one version and is known as 'Sixteen Revelations of Divine Love'. The account in this manuscript is a shortened version, but it is important because it is much older and better than others published in the 17th and 19th centuries. This page, near the beginning of the writing, has her account of her vision in May 1373 during an illness when she was thirty and one-half years old.